Sputnik spoke to Infowars host Alex Jones to get his view on the situation around his ban from social media platforms and his take on Brexit. 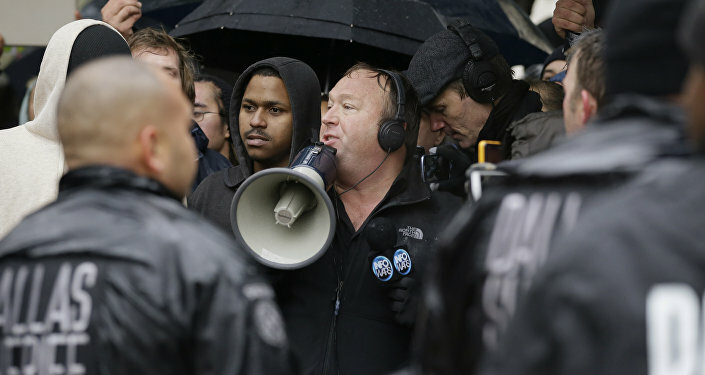 The American Civil Liberties Union has slammed critics of Infowars host Alex Jones, who consistently call for his banning from social media platforms such as twitter. Jones was recently banned for seven days by the platform. They see it as a dangerous precedent and direct threat to free speech in the country. The union recommends less retrograde steps such as removing individual posts that they see as a violation of its terms of service or to deprioritise their placement on social media newsfeeds. Sputnik: What do you make of your ban from twitter? Is freedom of speech in the US under threat? Alex Jones: What’s happening is, big tech has aligned with the Democratic Party and some major corporations to try to shut down nationalism and populism here in the United States and tries to basically steal the midterm elections that are coming up, in just 79 days from now. This is classic monopoly, where you have Apple and Google and Facebook, and Twitter and all these other major conglomerates, who control more than 95% of the internet coming together and saying ban Alex Jones. That was all done because Senator Warner, who is seen as the top Democrat now in the US, he has basically threatened an internet takeover, from the big tech companies if they don’t basically align against free speech. Trump has allowed a vacuum by not regulating the internet, by not defending free speech and not coming in and defending an internet bill of rights and it’s allowed foreign interests, the EU to try to regulate the internet, the Chinese communists to try to regulate it, but also the Democratic Party. As Republicans have said “hey we’re free market, we’re hands off, we’re going to leave the internet open and free”, that creates and opening and vacuum for the sharks to come in, with intimidation, to try and bully folks into allowing internet censorship. They’ve chosen me to be demonised, they’ve built me up as this bad guy, and now after they’ve demonised me for two years, they’re trying to have me as the first domino that falls in the first amendment in the United States. Sputnik: Has political correctness in the US gone too far? Alex Jones: Well sure; it’s corporate correctness, this is what it is. Big multinational corporations want to integrate the United States with Islam, Socialist and Communist Republics south of the border and they just want a compliant, controlled population. That’s what political correctness is now, it’s a form of authoritarianism and the public not just here, but all over the world has roundly rejected it, with the Brexit with Russian sovereignty, with Catalonia, the Brazil elections, in Greece, Italy, Iceland and Reykjavik. Everywhere, people want self-determination, they want to control their own lives, and they don’t want a monopolar corporate world government that dominates the nation states. They want a multipolar world. Sputnik: What are your thoughts on Brexit? Alex Jones: I think Brexit is great because you have the bureaucracy of the EU, set up as a so called steel deal years ago, unelected, sure they have a parliament but it’s ceremonial. You have the EU commission as a dictatorship, that’s already making 93% of the laws in the UK, and so the people voted to be self-determinative, they voted to pull out and now the EU is threatening to sabotage any trade deals they’ve got with the continent, which would hurt Europe and the UK and everybody else and saying no, you have Brussels and Junker saying, we will decide what you do, it’s a true tyranny. Regardless of what they push, or what they do, if they try to steal Brexit from the British people and from the UK, it’ll only make them come back even stronger, with self-determination in the final equation. That’s why the leftists are trying to flood Europe with a lot of Islamists and other populations, to try and water down the nationalism of the countries, but I think in the end it’s going to backfire and we’re going to see the EU break up in the next 5 years, I think we’re going to see Eastern Europe become self-determinate, and I think you’re going to see the United States doing the same thing, because people have a hunger for individualism, a hunger for liberty and a hunger for their own destiny.